May I Have This First Dance? (requires Flash Player 7 or higher). Click on selection to hear song. 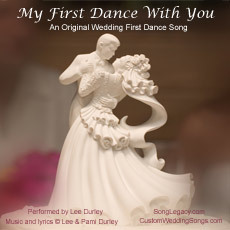 This original wedding first dance song May I Have This First Dance? is available as an MP3 download, along with an illustrated lyric sheet and CD jacket cover image for downloading in pdf format. You can use a music CD creation program to write the song on a CD to give to the DJ to play at your reception, and you can print the CD cover image to insert in the CD jacket. The illustrated lyric sheet can be printed for inclusion in the wedding album or for framing. This song would also be ideal for an accompaniment to a wedding video. Roger Eddy is the composer, Kathleen Tarp is the lyricist, and Neal Banks is the vocalist on this recording. Playing time of the full song is 3 minutes 8 seconds. May I Have This First Dance? In addition to the MP3 file and lyric sheet, your purchase will include a higher quality version of this downloadable CD cover image created especially for this song. You can write a personal message or add a photo to the CD cover image before inserting it into the CD case, transforming the CD case into a greeting card. 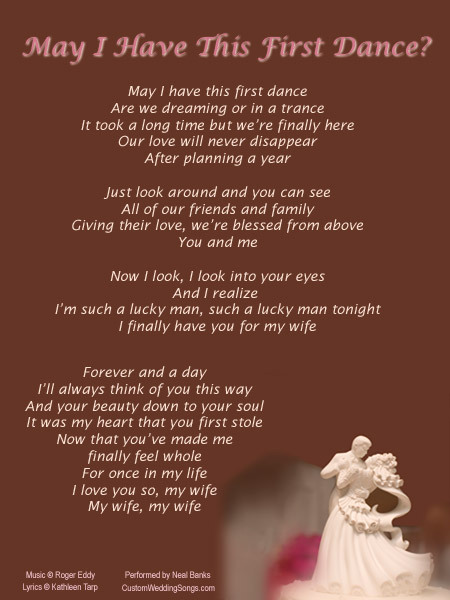 Click on the "Buy this song" button below to order your download of this original wedding first dance song in MP3 format, along with a higher quality version of the lyric sheet and CD cover illustrated above, for only $9.99. You must go through the PayPal checkout procedure to complete your order. After your PayPal payment is complete, you should click on "Return to Merchant" at the bottom of the PayPal "Thank you for your payment" page, to receive your instructions for downloading the files immediately. We will also send you a follow-up message including the instructions for downloading your files, in case you run into problems with downloading immediately after your PayPal payment. Note: To make sure that you'll receive our messages, please add our e-mail address to your e-mail "safe list" or address book. AOL users: add our e-mail address to your "people I know" list. Earthlink, Hotmail, and Yahoo users: add our e-mail address to your address book. Users of other ISPs: If your ISP blocks emails from unknown users, please contact them and instruct them to "safe list" our e-mail address. If you have any problems, contact us via e-mail. We also offer personalized First Dance songs with unique lyrics based on the information provided by the customer about the bride and groom. See our Personalized Songs page or Contact Us for additional details about these options. Please note that this product is an MP3 file of an original song, including vocals, along with lyric sheet and CD cover illustrations which can be printed. We do not offer sheet music or recordings of background music.